﻿ Reports Dashboards | Employee Based Systems Please fill up the captcha. Real-time data matters when it comes to your bottom line. Make smarter decisions with EBS Business Intelligence and Analytics. Discover why thousands of organizations trust EBS's platform to securely deliver self-service BI and data discovery to their users. It’s easy to learn for everyone. Most reporting requests are minor changes that users can learn to get themselves. Alter existing reports by adding fields, filters or pivots and save a new variation in seconds. Automatic scheduled and alerts-based reporting. Global reports and dashboards template controls. Tenant, group, role, and individually based sharing, rights and security controls. PDF, Word, Excel, CSV, RTF and XML exports. Excel like ranging, highlighting, and conditional formatting. Dynamic and interactive charts, graphs, and gauges. Deliver responsive, real-time visualizations with HTML5 powered dashboards. Slice and dice data with pivots and analysis grids. Works on desktop and mobile. Executives love seeing the important details in one screen. EBS provides rich interactive dashboards for instant insight. Air-tight row level data security. Drilldowns, sub-reports, and in-app or web linking. Advanced arithmetic and expressions options. Limitless filter options and controls. In memory pivots for on the fly slice-and-dice analysis. Complete data aliasing, categorization and grouping options. Last quarter’s data isn’t relevant to today’s challenges. EBS Reports helps end-users stay competitive by providing real-time analytics for everyone, everywhere. From a critical presentation in the boardroom to a quick check via cellphone, users can create and immediately view reports, without relying on IT. 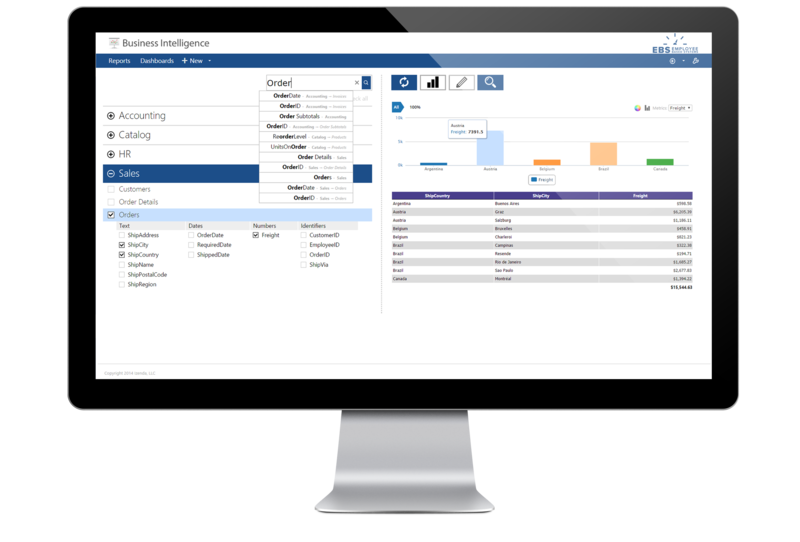 For users who thrive on Microsoft Excel, EBS provides full support for detail-oriented operational reports needed to keep day-to-day business operations moving. You have the power to slice and dice data with dynamic pivots and analysis grids. EBS has been built from the ground up with self-service customization in mind. From a critical presentation in the boardroom to casual analysis on a Sunday afternoon, you’ll have the flexibility to manipulate existing reports in new ways. This is the most important part of next generation analytics. Modern users want instant insights into massive data sets. EBS’s easy-to-learn Instant Reports technology starts with a Google-like search. Discover data you didn’t even know you had or start building reports even if you don’t fully understand the data model. As data scales to trillions of records, grid-based analysis is no longer enough to find important patterns. Clarify live data with rich dashboards, drill-down reports and data hierarchies to discover new patterns and trends. Stay competitive in today’s global marketplace by responding quickly to real-time dashboards. EBS delivers self-service analytics that anyone in the user community can take advantage of, not just the analysts. Executives, managers and staff can drill-down data with our dashboards without waiting for IT or data scientists. Most reporting requests are minor changes that users can learn to get themselves. Alter existing reports and dashboards by adding fields, filters or pivots and save a new variation in seconds. Deploy with a library of core reports and dashboard templates, and let users address their own complexities.